I was amazed at what I saw at the garage this weekend. An $80,000 MK1 TT that was sold by it owner for… $11,000. Reason in two words? Nitrous Backfire. 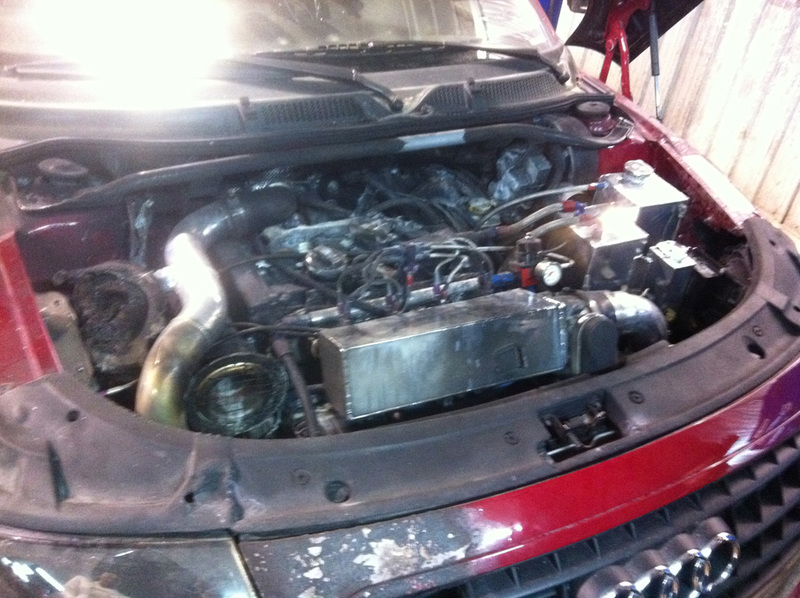 Yes, this 500HP+ 4 cylinder TT lost its life in just a few seconds, as a nitrous oxyde backfire took the engine out. Nitrous oxide (often referred to as just “nitrous” or “NOS” as the latter refers to the NOS brand, derived from the initials of the company name Nitrous Oxide Systems) allows the engine to burn more fuel by providing more oxygen than air alone, resulting in a more powerful combustion. (By weight, Nitrous contains 36% oxygen while air has only 23%.) The gas itself is not flammable at a low pressure/temperature, but it delivers more oxygen than atmospheric air by breaking down at elevated temperatures. Therefore, it is often mixed with another fuel that is easier to deflagrate. Nitrous oxide is stored as a compressed liquid; the evaporation and expansion of liquid nitrous oxide in the intake manifold causes a large drop in intake charge temperature, resulting in a denser charge, further allowing more air/fuel mixture to enter the cylinder. Nitrous oxide is one of the simplest ways to provide a significant horsepower boost to any gasoline engine. Even if the engine is up to the task, severe damage can occur if a problem occurs in the fuel system; an engine running with nitrous oxide depends heavily on the proper air to fuel ratio to prevent detonation from occurring. For example, if the engine’s fuel supply were to be reduced, this would cause the engine to run lean by whatever degree the fuel delivery was reduced, which can lead to engine knock, detonation or backfire. Depending on the engine, this may only need to occur for a matter of seconds before major damage occurs. It is essential not to reach a fuel cut rev limit as this will also momentarily restrict the fuel flow to the engine and as nitrous is still being injected into the engine without the additional fuel the engine will again run lean and cause detonation. Good optimisation of enrichment fuel is essential otherwise the fuel can ‘drop out’ and puddle in the intake tract, potentially causing a backfire. So what happened exactly to this TT? Not sure. My theory: a) The driver launched the nitrous at a too low RPM or; b) Ran the TT too lean. At low RPM, think about what’s going on: you’re spraying nitrous into the intake at a constant flow. That is, the nitrous bottle and solenoids have no idea what RPM you’re at, and they’re just pushing it into the intake at a constant volume. Inside the engine, though, the nitrous and fuel combination is being sucked into the cylinders during every stroke. The net result is that at low RPM, you’re getting far more of the mixture into the cylinders. At 3000 RPM, for example, you’re getting twice the amount as at 6000 RPM. So, you can imagine that running nitrous at, say 1000 RPM, is far more stressful on the motor as at 3000 RPM, and probably caused the TT’s nitrous backfire (the nitrous/fuel combination exploded in the intake manifold rather than in the cylinders. This entry was posted in Audi TT MK1 Performance and tagged nitrous oxide. Bookmark the permalink. i’ve got a deal for you. I was the driver of this TT when it burnt. There has been lots of assumptions in this text here and let me get it straight. I was doing a top speed run when and pushing the engine over 250 Kph. The big turbo is placed to the rear of the engine and was placed really close to the firewall. The nitrous has a leak on one of the line so the mix of heat and nitrous just created the perfect mix for a fire in the firewall. I popped the first fire extinguisher and the the second but the fire was behind the dash so no hope. The firefighter saved the car as much as they could but since me and my ex just divorced and had invested the money into the car we just sold it to clear the debt cause the insurance company never wanted to pay for it cause it was highly modified. Send me pictures! (Before and after) I’ll create a post on your TT. Which company were you insured with?